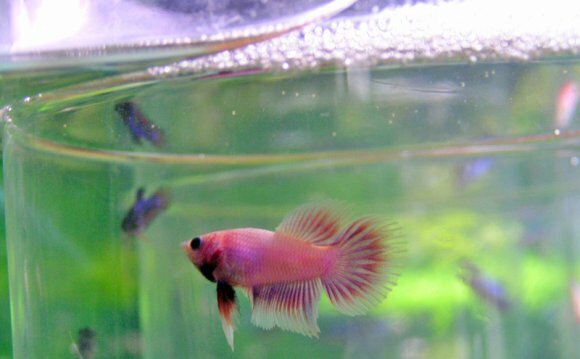 How to breeding Siamese fighting fish? Betta or Siamese Fighting Fish are widely available and very popular in the hobby today. Selective breeding has produced a variety of color morphs all of which can be an attractive addition to any community aquarium. Although male Betta fish will battle to the death, a single male can live peacefully in a community tank. Betta fish are Anabantoids and are capable of surviving in the smallest amout of water. They can do this because of their ability to breath air. Keeping them in a small cup or bowl of water should be regarded as cruel and should be avoided. They are much happier, more active and more brightly colored when they have a larger area for swimming and water conditions are optimal. I recommend the baby biOrb 4 Gallon Aquarium Kit as it is perfect for a single male Betta Fish. You can provide heating for the this tank with the Zoo Med Aquatic BettaTherm Heater. While male Bettas will fight with other males, a single male can live peacefully with other community fish. If a male is kept with a female it is best to keep several females to divide the attention of the male up between them. Remember, the more swimming space the happier the betta fish will be and then the true beauty of this fish will show. When spawning, the male will build a bubble nest, then the male and female will engage in a courtship and the female will release hundreds of eggs. The eggs will be placed in the nest and guarded by the male. The eggs hatch after 36 to 48 hours. Betta fish a very hardy and easy to keep. They will accept a variety of foods but have a fondness for blood worms. Tetra Blood Worms Freeze Dried Treat are an excellent choice. With proper nutrition a single male Siamese Fighting Fish is a great addition to a community aquarium.